Organized in Brooklyn, New York in 1872, the business moved to Lyons, New York, in 1889. In 1893, a business owned by A. H. Towar was purchased and continued under the name New Haven Silver Plate Co. The firm was in the original group that formed International Silver Co. Around 1900 the plant was dismantled and the machinery, tools, and material moved to Meriden. The trademark was used on inexpensive silverplated hollowware until about 1908." — Edmund P. Hogan in An American heritage: A book about the International Silver Company (1977), p. 167 (see entry below). Manhattan Silver Plate Co. (c. 1898-1904). Serving bowl. Silver plate. (Cat. ID no. C1971.36.64. Viewed 26 July 2018. C00154). Bonhams San Francisco - Butterfields SOMA (16 MAR 2003). 1 May - 30 October 1893. World’s Columbian Exposition, Chicago, Illinois. > Unspecified designs exhibited by Manhattan Silver Plate Co.
University of Connecticut, Storrs, CT call no. 1980.0008. (1876). Advertisement: "Manhattan Silver Plate Co., office, 39 John Street, New York... silver-plated ware, ice-pitchers, castors, cake baskets... spoons, forks and table ware of the finest quality..." In The new line between New York and Philadelphia to the Centennial (travel / promotional booklet), p. 43. George L. Catlin: New York. (Viewed 20 April 2018. G02063-64). Online - Courtesy University of Champaign-Urbana, Illinois. Also see listings: March 1878; April 1878; May 1878; June 1878; July 1878; August 1878; September 1878; October 1878; November 1878; December 1878. (11 May 1880). Classified advertisement: "A Hand Burnisher wanted to work on silver-plated ware. Manhattan Silver Plate Co., 301 East 22d st." The Sun (New York), presumably p. 4, col. 1. (Viewed 21 September 2018. B00360). (30 September 1880). Classified advertisements: "A solderers accustomed to work with blow pipe..."; "A Silver Plater and gilder on britannia ware. Manhattan Silver Plate Co., 301 E. 22d st." The Sun (New York), presumably p. 4, col. 3. (Viewed 21 September 2018. B00360). (25 August 1882). Classified advertisement: "A number of hand burnishers wanted... Manhattan Silver Plate Co. ... 301 East 22d st." The Sun (New York), presumably p. 4, col. 3. (Viewed 14 October 2014. B01046). (17 August 1884). Classified advertisement: "Sand buffers and female hand burnishers on Britannia ware. Manhattan Silver Plate Co., 301 East 22d st." The Sun (New York), p. 7, col. 6. (Viewed 14 October 2014. B01047). (1886). Advertisement for Manhattan Silver Plate Co. In Bloomingdale’s illustrated 1886 catalog, p. 151. Reprinted in 1988, Dover edition, in association with the Henry Ford Museum, Dearborn, Michigan. (Viewed 20 April 2018. G02062). Online - partially - Google Books. 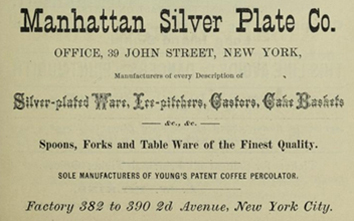 Manhattan Silver Plate Co. (25 February 1887). Classified advertisement: "WANTED— A caster to work in britannia metal. Manhattan Silver Plate Co., Hoyt & 3d sts. B’klyn". The Sun (New York), presumably p. 5, col. 4. (Viewed 17 October 2018. B01111). (20 February 1890). Our items [with mention: "The Manhattan Silver Plate Company, of Lyons, has received an order for 15,000 napkin rings." The Newark Courier (Newark, New Jersey), presumably p. 3, col. 2. (Viewed 17 October 2018. B01112). (17 May 1890). Court calendar [with mention: "March 24, 1890. 24. Manhattan Silver Plate company vs. The Greenwich Insurance company."] Newark Union (Newark, New Jersey), presumably p. 3, col. 7. (Viewed 17 October 2018. B01113). (27 September 1893). 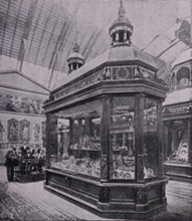 The exhibit of the Manhattan Silver Plate Co. Jewelers’ Circular and Horological Review, pp. 25-26. (Viewed 21 April 2018. G02083-85). Online - Courtesy Museum of Metropolitan Art, New York. (21 February 1894). News gleanings (including mention of the Manhattan Silver Plate Co.). The Jewelers’ Circular and Horological Review, p. 34. (Viewed 5 September 2018. F00291). (14 March 1894). Chicago notes (mentioning Manhattan Silver Plate Co. adding electric lighting at their factory at Lyons, New York and building a railroad connection). The Jewelers’ Circular and Horological Review, p. 20. (Viewed 5 September 2018. F00293-94). (28 March 1894). Connecticut (with statement about Manhattan Silver Plate Co. running overtime). The Jewelers’ Circular and Horological Review, p. 25. (Viewed 5 September 2018. F00295). Manhattan Silver Plate Co. / New Haven Silver Plate Co. became part of the International Silver Company in 1898. After this date, it is assumed that any design patents utilized by the division or brand were assigned to the International Silver Company. (See the ISC historical documentation page). (3 January 1900). Chicago notes [news brief, talks about International Silver Co. consolidation and salesrooms effects in Chicago; mentions Barbour Silver Co., Holmes & Edwards Silver Co., Manhattan Silver Plate Co., Meriden Britannia Co., Rogers & Hamilton Co., Simpson, Hall, Miller & Co. Jeweler’s Circular and Horological Review, p. 34. (Viewed 7 May 2018. AAA02967; AAA02074). (5 February 1900). [No article heading; listing the Manhattan Silver Plate Company, Lyons, New York as "Factory D" of the International Silver Company]. The Daily Morning Journal and Courier (New Haven, CT), p. 1, col. 7. (Viewed 29 September 2018. B00566-67). Kovel. Ralph M. & Terry H. (1961). "Manhattan Silver Plate Co." marks. (Also mentions a company which might be affiliated, Lyons Silver Co.) A directory of American silver, pewter, and silver plate, p. 337. Crown Publishers, Inc.: New York. (Viewed 20 April 2019. G02065-66). Online - Courtesy Marin County Free Library, San Rafael, CA.